Al and I were fed up with our existing kitchen units, so we decided to attempt to re-spray everything to get a whole new look while keeping costs down. The units had a wipe-clean, plastic-y surface, so a primer coat or two was needed to ensure that the top coat stuck. We're planning on painting the living room/kitchen white, so we chose grey as a nice contrast. 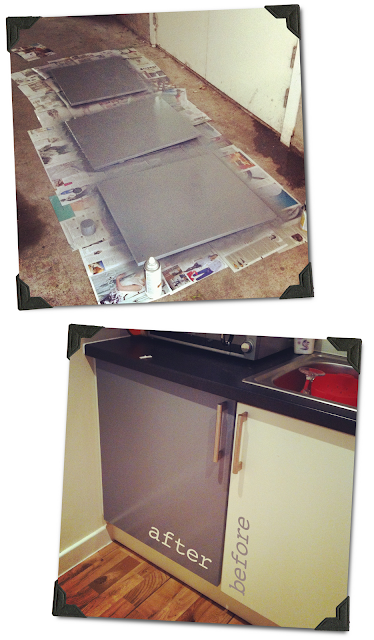 It was pretty easy to use the spray paints, getting an even coverage with two or three coats. I don't know how well they will wear, but I think our kitchen looks a lot better! What about you?